Many, many years (~15) ago I fitted a cruise control to my Daihatsu. After about five years I replaced the car and removed the cruise control. I eventually gave the car to my son, its commercial value was about $150, with the cruise control bits in a box, for him to refit. He never did, and 10 years later I got the box back, so the unit is about 15 years old. Now the big decision, fit it to the Wolseley or the MGB. For what ever reason I opted for the Wolseley, maybe more space to fiddle around in, and relative easy access behind the dash. The cruise control is a Command AP50D, the D stands for digital, as opposed to earlier analogue units. It consists of a vacuum actuator, an electronic control unit, a dash mounted control pad, and lost by this time, speed sensing magnets, to fit on the drive shaft. I wouldn’t have used the magnets anyway, as I’ve had the drive shaft balanced, and these magnets would unbalance it again. Current model of this type is the AP60B, which seems to be very similar, except that the control pad only has three buttons instead of four. The old unit has an On button and an OFF button, the new unit has just the one button, presumably push ON and then push OFF. So the project was broken down into two parts, mounting the actuator and connecting the cable to the carby. 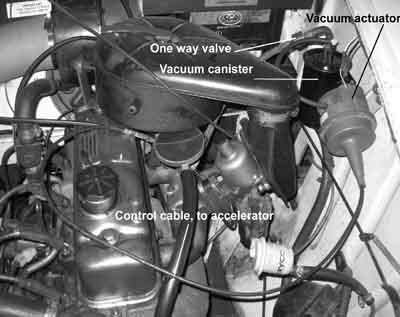 I have found, in the past, that for the vacuum you must have a separate vacuum chamber, isolated from the engine vacuum by a one way valve. This is necessary as when a higher demand is put on the engine, by opening the throttle, the engine vacuum is decreased and the cruise becomes limited in its ability, whilst the separate chamber keeps the vacuum up. I have sourced these from Mitsubishi cars, at the wreckers. This chamber also needs to be fitted under the bonnet. The other part of the installation is the electrics. These gave me the most troubles, particularly with getting a speed signal. I had planned to use the ignition pulses as the signal. This involved a lot of trial and error before I got it right. The ignition pulses are related to ground speed, but only in a manual car. The first trial was to use the pulses from the points end of the coil. To get rid of multiple pulses from ringing and contact bounce, I copied the input filter circuit from the RVC tachos. This worked well, except that the cruise only worked above 50 MPH. Not good, as I wanted to control it down to a minimum of 40 KPH (24 MPH). Scratch the bald spot to think of another way. Ahhh! 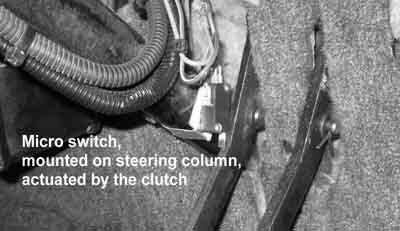 Yes use a signal from an ignition lead. Made a clip on sensor, again it worked well, except it only controlled up to 40 MPH. So I need a signal of more than one cylinder’s ignition and less than the four from the points. A divide by two circuit seemed the way to go.I found the power filter necessary, since the cruise control would drop out, if something like the indicators was turned on. So some more bench fiddling, but then the BB’s clutch packed it in. So with having to fix the clutch, then Christmas and 6 weeks holidays, a lot of time had slipped by. 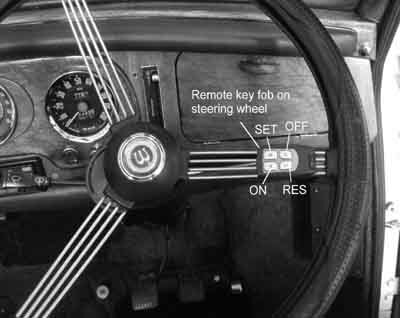 In my earlier tests, I found that the dash mounted control pad was dangerous, in that I had to significantly take my eyes off the road to use it. Our family Hyundai has the controls on the steering wheel, a much better location, and yes one can buy a wheel fitted control at about $180, but not necessarily compatible with the old unit. 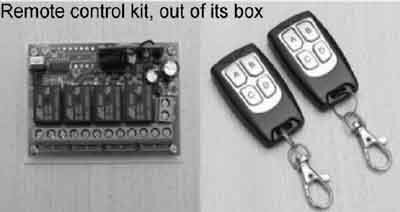 Fortuitously I found a 4 channel remote control kit, on eBay for around $15, comprising two key ring fobs and a receiver, with relay outputs. I used this, with one of the fobs mounted on the steering wheel and the relay contacts wired across the control pad’s switches. Initially I was going to have the control pad, the remote receiver, the cruise control box and the speed signal electronics, in another box (with power filtering also built in), all separately mounted behind the dash. Count it, that’s space for four boxes I had to find. 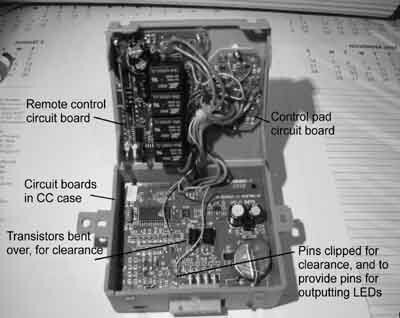 Still messing around with it all, on the bench, I looked at all the pieces and thought that there seemed to be enough extra room in the cruise box to mount both the remote receiver and the control pad circuit boards, in the lid. And so it turned out to be. Another side effect of this is that the wiring of the different boards was simplified, in that it was all inside the one box, no external looms to worry about, except for the power filter and divide by two circuit, which still were in a separate box. Note that the screw terminals of the remote were removed. 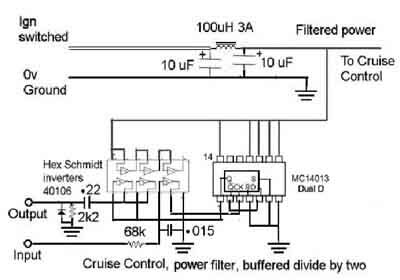 As part of the functioning of the cruise control, a cancel signal needs to be wired in. This comes from the brake light switch, so that when you are braking the cruise control is turned off and not trying to keep your speed up. With a manual car it is strongly advised to also have a cancel signal, from the clutch, so that the engine isn’t over revd when you change gears. This entailed the fitting of a switch to the clutch. All tested and working. An advantage of using the engine revs as a speed source, is that I can now cruise at very slow speeds, because I’m in a lower gear, for those engine revs.